Fig 1: Top) Time series of the cumulated Greenland ice sheet (GrIS) Surface Mass Balance (SMB) in GT simulated by the regional climate model MARv2 forced by the ECMWF (operational) reanalysis since 1 Jan 2010 (in green), 1 Jan 2011 (in orange) and 1 Jan 2012 (in red). The 1958-2011 mean simulated by MAR forced by ERA-40 (1958-1978) and by ERA-INTERIM (1979-2011) is also plotted in black. Finally, the absolute minimum cumulated SMB over 1958-2011 is plotted in blue. After Mid-July, the 2012 cumulated SMB is below the absolute minimum (2010)! Middle) Time series of the daily mean GrIS near-surface temperature (TAS) simulated by MAR. The absolute maximum temperature of each day is plotted in blue. Bellow) Time series of the North Atlantic Oscillation (NAO) index from Climate Prediction Center. Fig 2: Time series of a) the daily mean GrIS TAS (in °C), b) production of meltwater (in GT/day), c) melt extent (i.e. area where the daily meltwater production > 1 mmWE/day in % of the ice sheet surface), d) bare ice extent (i.e. 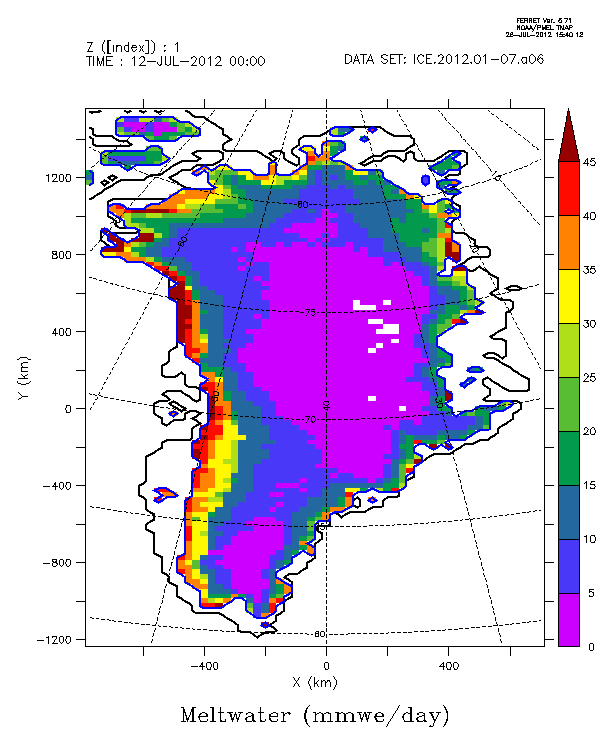 area where the surface density is > 900 kg/m^3 in % of the ice sheet surface) and e) daily mean GrIS surface albedo simulated by MAR forced by ERA-40 (1958-1978) and by ERA-INTERIM (1979-2012). Fig 3: Daily meltwater production in mmWE/day simulated by MAR on 21-Jul-2005, 08-Jul-2012 and 12-Jul 2012. 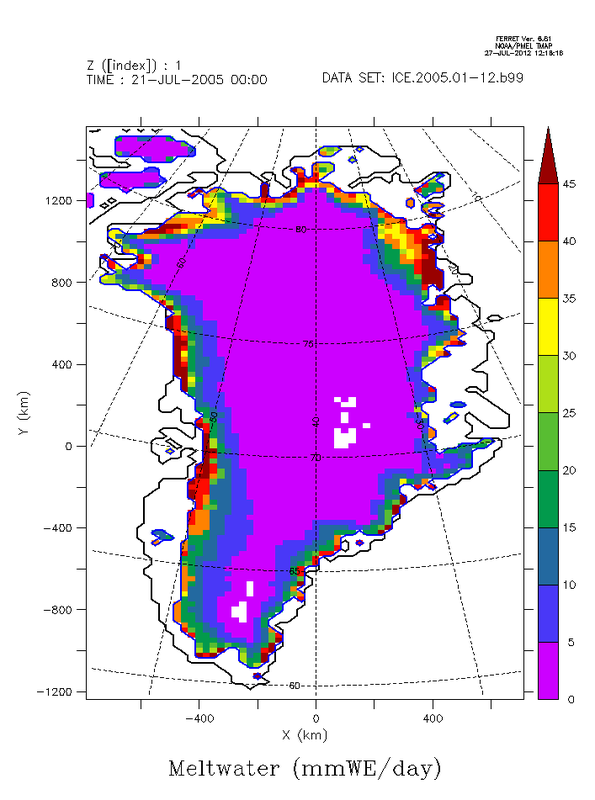 As pointed out by NASA, the melt extent simulated by MAR was very large on the 12 of July 2012 and covered almost the whole ice sheet. It is exceptional for a beginning of July but it is not the first time that melt occurs everywhere over the ice sheet (e.g. 21-Jul-2005) as shown the "blue" time series in Fig2c since the MAR-based melt extent was validated with the satellite derived on in Fettweis et al. (2011). In Fig2c, melt extent does not equal to 97 % as NASA because I use a different melt threshold (daily meltwater production > 1 mmWE/day). But, it should be noted that the 12 of July 2012 seems to be the day with the highest daily meltwater production simulated by MAR since 1958 as shown Fig. 2b. Reconstruction of the 1979–2006 Greenland ice sheet surface mass balance using the regional climate model MAR, The Cryosphere, 1, 21-40, doi:10.5194/tc-1-21-2007, 2007. 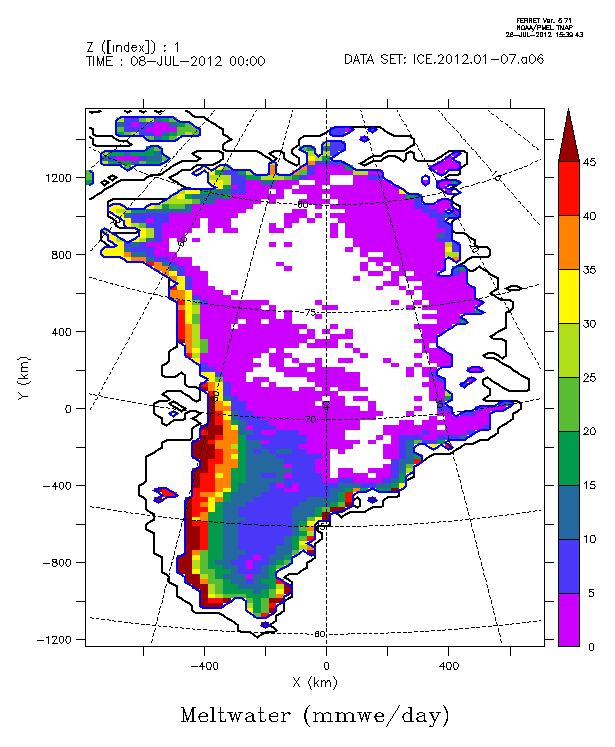 Fettweis, X., Tedesco, M., van den Broeke, M., and Ettema, J.: Melting trends over the Greenland ice sheet (1958–2009) from spaceborne microwave data and regional climate models, The Cryosphere, 5, 359-375, doi:10.5194/tc-5-359-2011, 2011.